3 Bedroom Terraced House For Sale in Exeter for Asking Price £225,000. 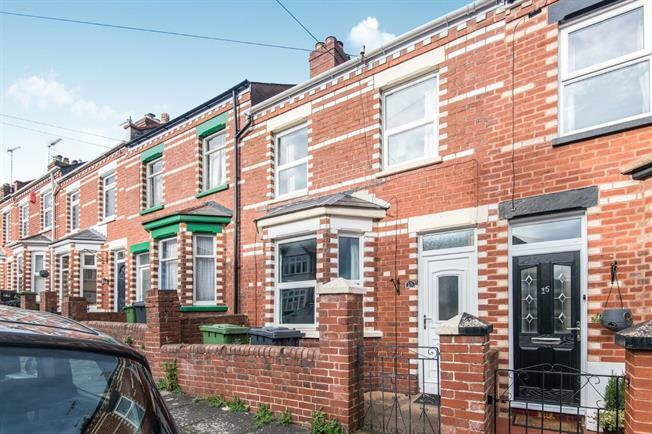 An early viewing is highly recommended to make the most of this Victorian terraced property. Accommodation to the ground floor comprises an open plan lounge/dining area, kitchen and sun room to the side of the property. To the first floor you will find three bedrooms and a modern family bathroom. The property benefits from a well maintained courtyard garden to the rear with a summer house. The property also benefits from UPVC double glazing through out. UPVC double glazed bay window to the front aspect, wooden flooring. Fireplace containing electric fire, two wall mounted electric heaters. UPVC double glazed window to the rear aspect. Stairs rising to first floor, under stairs storage cupboard. Space for dining table and chairs. Wooden double glazed windows to the front and side aspects. Wooden door providing direct access to the courtyard garden. Two UPVC double glazed windows to the front aspect, carpeted flooring, wall mounted electric heater. UPVC double glazed window to the rear aspect, carpeted flooring, wall mounted electric heater. A white and modern three piece suite comprising bath with shower and mixer taps over, low level WC and pedestal hand wash basin. UPVC obscure double glazed window to the side apsect. Tiled surround and flooring. Hated towel rail and extractor fan.